The idea: Use an Arduino-like µC to control a set of CPU fans by control the voltage the CPU fans receive. My question: How can I do this in an easy way? Yes, I know, there is PWM but this is not very suitable for this purpose: I did some tests with it but it turns out that the characteristics of PWM fans don't suite my purpose: PWM fans are designed to be controlled between not audible and full speed, not between nearly not rotating and full speed. Even very special fans with a wide range of PWM speed control don't work as well as powering a regular 12V fan with just 5 or 6V. Which brings me to an alternative idea: It should be possible to send an I2C or SPI signal to some kind of IC that then provides a voltage as required. Alternatively to that there seem to be PWM controlled voltage regulators available. But that doesn't seem to be a very elegant solution, isn't it? Or is there an even better way of controlling the voltage output to the fans I'm not aware of? I'm aiming for a solution that works well and can be build with little effort. Unfortunately I don't know how to do that: I can't find any breakouts I could use right away for that purpose. Probably there are some and I just have not been able to find them? Any help is appreciated! It's actually very simple, and it indeed does involve using PWM. PWM is just a signal being on for a percentage of a predefined period. That percentage is also, when the PWM signal is averaged out, equivalent to a percentage of the peak voltage of the PWM signal. So if you take a PWM signal and use it to switch a higher power source (say, through a P-channel MOSFET that's being itself switched by an N-channel MOSFET), then add smoothing to that switched output, and you have a variable voltage. If you want to know what that voltage is you can add a resistor network to the output (assuming it's higher than the voltage the MCU can handle) and read the divided voltage using an ADC. You can then use that as a feedback loop to adjust the PWM duty cycle to get your desired voltage. That is precisely* how switch-mode power supplies work. Use PWM to switch a FET that controls an incoming voltage, then smooth it out, adding a feedback network for control. *Apart from the PWM bit: they often use other methods of switching the signal to get better efficiency at different loads, such as PFM. Not the answer you're looking for? 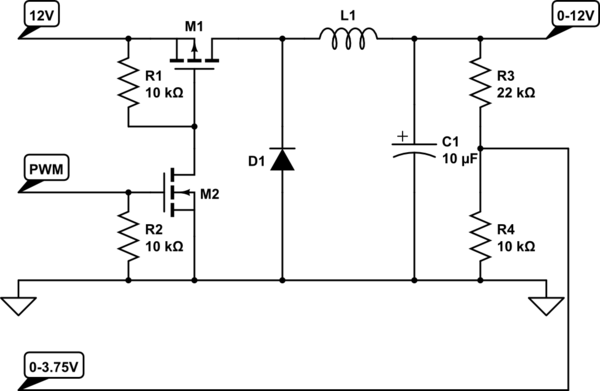 Browse other questions tagged voltage-level voltage or ask your own question. How can higher current devices (motors, solenoids, lights, etc.) be controlled by an Arduino? How do you use an Arduino to control a 4 - 20 mA transmitter? How can I2C be made to work through a level shifter?